A glass clear gloss print-receptive waterproof face film. The film sheet backing (85 micron) provides optimum dimensional stability for exact positioning. Permanent acrylic pressure-sensitive adhesive for durability. Suitable for most laser and copier (dry toner) print processes, both mono and colour, ranging from mid to low volume up to full production machines. 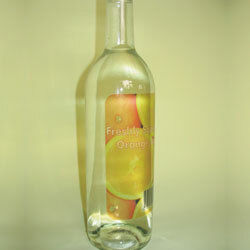 Ideal for bottle labelling and other applications which require the printed images or text to appear as if it has been printed directly onto the surface below. XE Produces quality print results on mono and colour laser printers. (User tip: When printing Polyesters by laser or copier methods please refer to your printer manual for optimum film settings).